This high-performance, antibacterial hand soap offers luxurious lather along with an appealing plum fragrance that is subtle and never overwhelming. 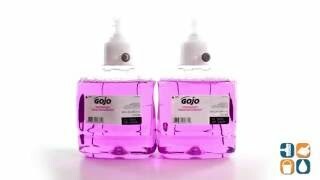 Enriched with a moisturizer, natural extract and skin conditioner, Gojo LTX-12 Foaming Handwash keeps hands moisturized and helps maintain skin health even after repeated use. Each refill is Sanitary Sealed and comes with a fresh dispensing valve to lock out germs and prevent cross contamination. The USDA certified biobased formulation will delight users while protecting the planet. Patent pending Controlled Collapse technology keeps bottle shape as it empties. Each bottle has crystal clear clarity for visual appeal and easier monitoring of fill level. Made from durable PET, refill bottles use 30% less material than standard rigid HDPE and are completely recyclable. 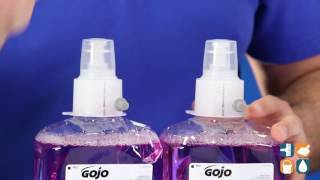 Stock up on Gojo LTX-12 Antibacterial Foam Handwash today and save! Soap Type: Foam; Application: Hand; Capacity (Volume): 1,200 mL.